When storage startup Egnyte first launched in 2007, it did a lot of things differently than the competition. The conventional wisdom at the time, which prevailed at companies like Box and Dropbox, was that the best way to win over business customers was to offer the core product for free, and sell them more storage, more services, and more stuff down the line. But Egnyte has always shied away from all of that: It never embraced that so-called “freemium” model, and opted instead to sell its “hybrid” cloud/server storage product directly to large businesses. As CEO Vineet Jain likes to boast, 100% of Egnyte’s customers are paying customers. “It felt very countercultural, like swimming upstream,” Jain says. It’s meant that Egnyte has kept a lower profile than the competition over the years — without a free product, there’s less word-of-mouth, and its big business customers aren’t exactly the types to crow about it from the rooftops. 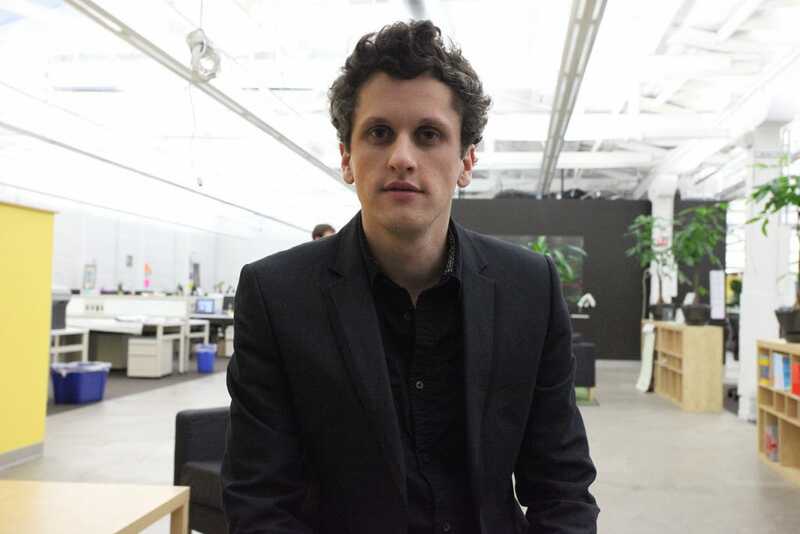 Over the last year, though, there’s been a shift amid a larger softening in the tech market: Box has lost the confidence of Wall Street as it continues to show unprofitability, while Dropbox has cut back on employee perks as it buckles down to ride out this chilly period. Meanwhile, Egnyte has been quietly building its business for the long haul, attracting customers like Nasdaq and Coach. The last time Egnyte raised investment capital was in late 2013, when firms including Google Ventures and Kleiner Perkins put in almost $30 million. 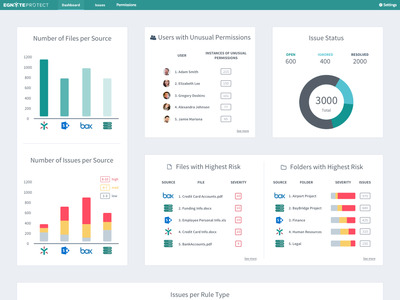 The new Egnyte Protect dashboard helps you identify at-risk files with confidential information, across multiple cloud services.Egnyte Protect tracks a company’s most sensitive files and helps protect them against accidental sharing. 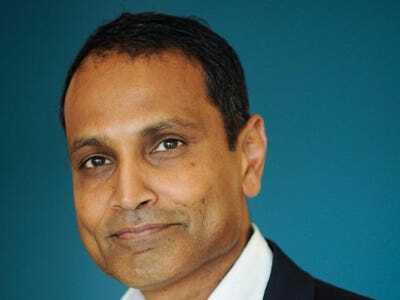 Jain says that Egnyte hasn’t had to go after more investor cash since, and that the company is on track for profitability by year’s end. Today, Jain looks downright prescient for focusing on the company’s fundamentals, and not sacrificing revenue just to attract users. “The virtues of how we built the company are getting more recognition,” Jain says. To keep the momentum going, Egnyte today launches Egnyte Protect, a new product to protect customers from their own human errors. 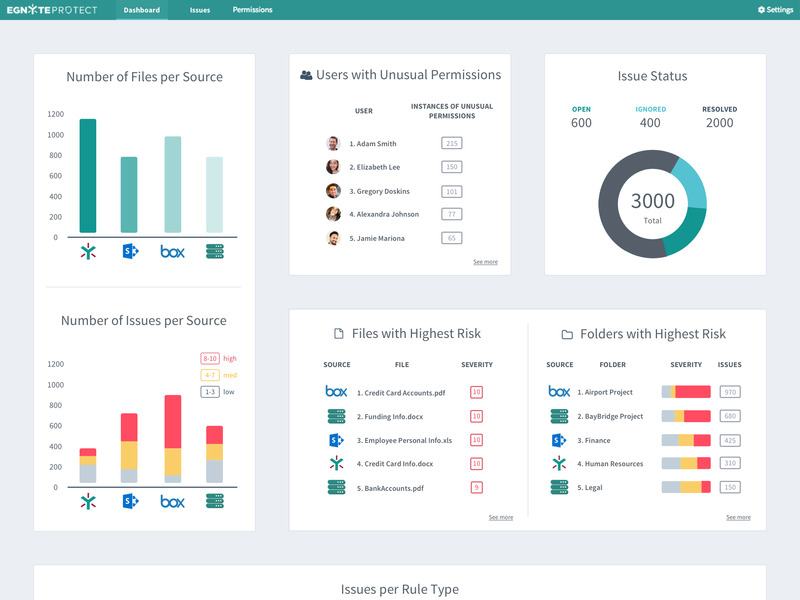 Basically, Egnyte Protect integrates with Sharepoint, Box, and Egnyte’s own EFS storage system, and helps prevent users from accessing and accidentally sharing files with sensitive information (like a social security number or a confidential contract). It will support Microsoft OneDrive and other products in the future. Egnyte Protect is the first time that the company is selling a product that doesn’t explicitly dovetail with the main Egnyte vision of providing storage that bridges a company’s existing servers with the cloud. Jain sees it as a way to broaden the company’s file storage expertise that lets them work with every other vendor, all at once. More importantly, it’s an extra premium service that Egnyte knows it can sell to everybody: Jain has already predicted doom for Box, Dropbox, and their ilk, because the realities of a competitive market means they have to keep dropping prices until they inch closer to zero. But all of those customers will still need a service like Egnyte Protect, says Jain, and the company can charge a premium rate for it. In other words, Jain believes that it can take Box’s customers, and Microsoft’s customers, even the free ones, and make a lot more money off of them. In that way, Jain hopes to keep Egnyte growing, bringing the tech to more places without compromising on its focus to get paying business users. “I’ve always been the same old me,” Jain says.